The New York-based practice Rafael Viñoly Architects was commissioned to expand and modernise the existing facilities of the Carrasco International Airport in Montevideo, the capital of Uruguay, with a spacious new passenger terminal to expand capacity and spur commercial growth and tourism in the region.The firm’s design places prominence on the public zones, including the secure runway-side concourse as well as the fully accessible roadside departure hall and terrace, by providing amenities such as open spaces, natural light, restaurants, retail spaces, and landscaping - all housed beneath a gently curved roof 366 metres in length. The gentle curve and low profile of the airport’s monolithic roof is inspired by the rolling dunes along Uruguay’s coastline. While the architectural solution for the Carrasco International Airport is modern by way of conception of space, function, and structure, the roof is regionally inspired and draws its strength from its relationship to the surrounding topography. The building represents Uruguay’s transformation from an important regional country to an international destination for commerce and travel. 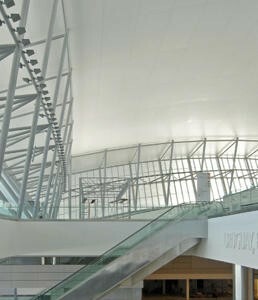 The atrium and the main hall have ceilings made of white PVC sheets and its concourse makes this a dramatic and welcoming place for everyone.